New Slogan? We Don’t Care. We Don’t Have To. We’re the DLC. Last week, we reported that Department of Liquor Control stores completely fouled up deliveries in the week before New Year’s. Now, DLC Director George Griffin did issue an apology. But that doesn’t restore any of the lost income or makeup for the stress caused by this total snafu. Real accountability would mean rebates. Even more galling is that time was found to distribute material to defend the DLC in stores even as this mistake occurred. It also undermines the DLC claim that their reform program has produced meaningful results. 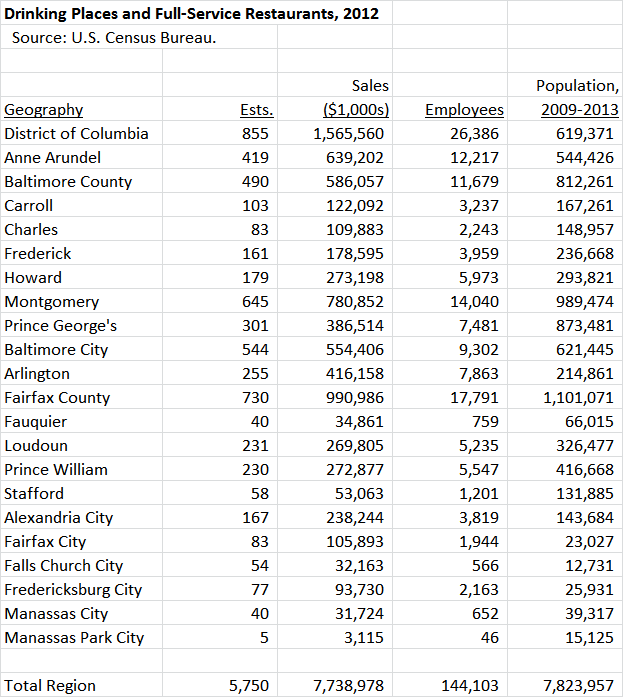 Restaurants are a major industry in Montgomery County. Beyond his misguided self-serving beliefs, saying that liquor reform is only of interest to restaurateurs is like saying that education is only of interests to parents so people should really quit their complaining. I’m sure restaurant owners appreciate George’s relegation of their repeat problems to illegitimate concerns. BTW, restaurants are not flourishing as much as we might hope. Elm St. in Bethesda Row is one of the hottest blocks in the county with high pedestrian traffic. Right now, there are three empty restaurant spots on the block with one more store ready to close. In Silver Spring, Jackie’s is calling it a day and Jackie Greenbaum says she’d never open another restaurant in MoCo–it’s just too difficult. George’s blithe dismissal of major problems at the DLC–even those affecting major customers who were buying a lot more than a latte and whose livelihoods depend on it–shows an alarming lack of concern for constituents or willingness to listen. In George’s view, mediocrity in a monopoly government service is acceptable–a level of contempt that his constituents should not. The movement to end the Montgomery County liquor monopoly is gaining momentum. Six legislators plan to introduce legislation to allow voters to decide the question. Comptroller Franchot penned an opinion piece last week arguing for its end. But I suspect that it’s the political potency of the issue with voters that will give it continued forward momentum. As of this writing, over 900 people have signed the petition asking Montgomery County’s State Senators and Delegates to end the county’s archaic liquor monopoly. Here are a few comments from petition signers that truly say it all. 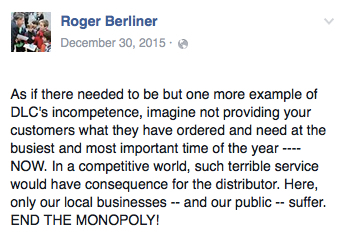 First of all, I appreciate Roger Berliner’s and the other County leaders’ embrace of this cause. Montgomery County, Maryland’s liquor laws are an embarrassing and harmful anachronism. County sales of alcohol do not serve any public purpose but they do perpetuate an expensive and useless bureaucracy. The County should not be a seller of alcohol but rather should serve as a responsible regulator of private restaurants and stores selling alcohol. Retaining the current system discourages the entry of businesses into the County and results in a conflict of interest for the County as both a regulator and a vendor selling to and competing with private businesses. Getting the County out of the liquor business would allow private enterprise to offer consumers more choices and more reasonable prices. At the same time, it would allow the County to focus on its regulatory role, while gaining additional tax revenue from businesses to lower individual taxes. I have lived in this County for more than sixty years. This useless charade cannot be ended too soon. I own 2 restaurants in Montgomery County, both well known for the breadth of their beer, wine and liquor lists. The difficulty in creating and maintaining these lists because of the county controlled system is extraordinary. It adds hours of unnecessary labor to my payroll costs, diminishes the quality of my beverage programs through the inconsistency of stock, unavailability of products and errors in delivery, and drives up the cost of the products we sell – which must either be absorbed by us (therefore diminishing our profits) or passed on to the consumer resulting in higher menu prices. This system causes all but the most intrepid restaurant owners to dumb down their offerings because it’s far far easier and ensures Montgomery County will never compete with DC in terms of the quality and creativity of its restaurants. I’m signing because this is 2015, not 1925. Ridiculous that this is still in place. Way past time to do away with it. I’m signing because I’m sick of being forced to drive out of MoCo to get the wines I want. It causes MoCo restaurants time, money, and frustration. It discourages new restaurants from considering moving to MoCo. The current system is cumbersome, useless, embarrassing, archaic, and typically paternalistic. I don’t need this County to make my buying decisions for me, thank you. I’m tired of having to go to DC or VA to have a wide choice of wines plus the prices are so much better. I am an economist, retired from the FTC after over 30 years. I worked exclusively on anti-trust cases. Monopolies hurt consumers. According to the Maryland Declaration of Rights “monopolies are odious”. If monopolies are so odious then why does Montgomery County have a monopoly on the sale of alcoholic beverages in Montgomery County? … because the monopoly is outdated, stifling, and ridiculous. And annoying. It has been proven to be a flawed system that restricts the store owner’s ability to maximize sales and be self-reliant on their success. The internal inventory controls have been called into question as of late as well. Time to open it up to the free market! I am tired of County stores with poor quality and customer service. I have to shop with a cart that has a pole on it so I can be tracked through the store, then I have to stand behind a piece of blue tape on the floor to be helped by someone who doesn’t want to be there. The selection is poor and I find myself shopping elsewhere. It’s time to get rid of soviet era liquor stores. We’re tired of driving to Total Wine in Laurel and Calvert-Woodley in D.C. to find good selections of beer and wine at reasonable prices. We want to spend our money here, but not at the premium we have to pay because of this ridiculous set up. Also, we want to see more restaurants locate here and they need access to good selections of fine wines, craft liquors, etc. This system no longer (if it ever did) makes sense. It is time for the free market to work its magic and for the county to cure its addiction to alcohol (revenues). A remarkably inefficient, and at times corrupt, system should not be tolerated by consumers and businesses directly affected by its protection. Let voters decide what happens. 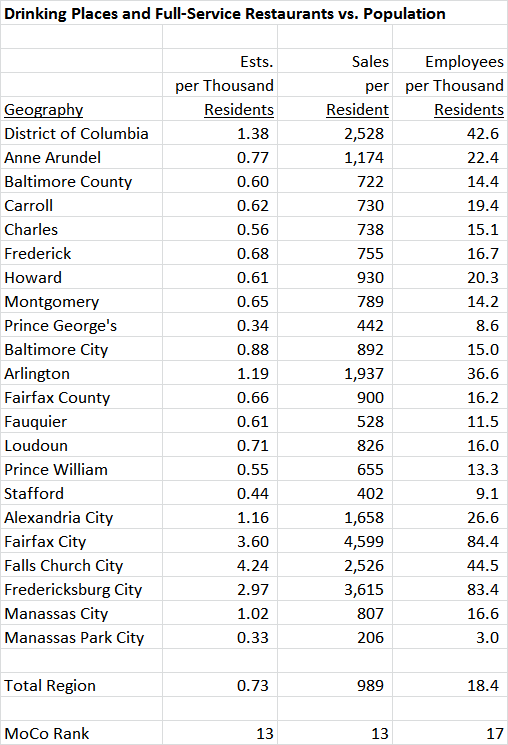 I spend money out of county in an effort to avoid the ridiculous monopoly in Montgomery County. It is insulting to my intelligence. I buy much of my alcohol outside MoCo. I want a wider selection and to not have to drive! The county should NOT be selling alcohol at all! I always thought that was stupid. The county has anti-drink programs and yet sells the stuff…let’s teach our kids hypocrisy, shall we? I’m signing because I do purchase all of my beer and wine in Washington, D.C. I live in MoCo and have to go to Frederick County (or Virginia) to get a couple of things that the county won’t allow to be sold. The current system is a total joke. I’m signing because I resent the county’s imposing a monopoly on its citizens. We’re grownups. Let us decide who to buy our alcohol from, and what to buy. I love Mo Co except this liquor business is an embarrassment. I don’t believe the county should have a monopoly on the liquor we buy or the choices restaurants have in what they provide customers. Currently, and for MANY years, I’ve purchased all my liquor in DC. Too bad for Maryland and time to smarten up. I hate having to drive to neighboring counties to find liquor stores with a decent variety to choose from. The county should not be allowed to continue its monopoly on alcohol sales to our businesses. I fully support allowing private sellers to compete with DLC in Montgomery County and putting this issue to a referendum so that it is clear how many county citizens desire a private competition approach.